Here at GateCrafters.com, we have an extensive gate opener selection available from some of the industry’s most respected brands, such as LiftMaster®, Estate Swing, GTO, Apollo, Mighty Mule, and many more. Because our gate openers come from the industry’s most trusted names, our customers can expect a product that truly stands the test of time and is sure to keep your gate performing at an optimal level for many years to come. Along with our selection of gate openers, we offer many other gate accessories from the same reputable manufacturers. From gate intercoms to keypads, transmitters to security products, you’ll find the exact product you need at a price you can afford in our inventory. All of our products are DIY, and we’ll provide you with all of the necessary parts and information to get your gate accessories set up quickly and properly. You don’t have to be an expert contractor to get your gate opener or other product set up properly. Along with the detailed, step-by-step instructions we provide, we also have a team of highly skilled gate installers available from 9:00am-9:00pm EST every day. 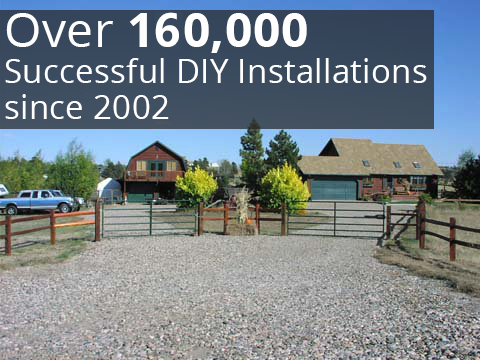 Our team is 100 percent dedicated to solving your installation problems and won’t rest until your job is complete. At GateCrafters.com, customer service is of the utmost importance to us, which is why we even offer after-hours support upon request. Our customers can rest assured, knowing that they always have a dedicated team of professionals at their disposal. For additional information about our gate opener selection and available driveway gates, please call or e-mail GateCrafters.com today.